Your Wild Apricot contact database contains information about people or organizations of interest to you and your organization. Information is stored for each contact in a separate record. The contact database includes both members and non-members. Anyone who makes a donation, registers for an event, or applies to become a member will have a contact record created automatically. You can also add records manually one by one or import them in bulk. 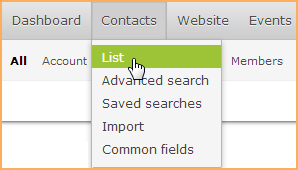 To view the list of your contacts, hover over the Contacts menu and select the List option. Name of the contact, the contact's member ID, and the contact's email. If the contact is a member, their member level, membership status and renewal date (if applicable). If the membership has been suspended, then this column is marked Suspended. Information for the last event for which the contact registered or joined the waitlist. Information for the last donation made by the contact. The current balance outstanding for this contact. Since Wild Apricot gives you the option to identify a contact using either the contact's name, organization name, email, or any combination of these, what appears in the Contact column may vary, as shown below. For more information, see Organization memberships. Any contacts that have a pending action, such as a transaction or a renewal, are indicated by a yellow warning icon next to their name. 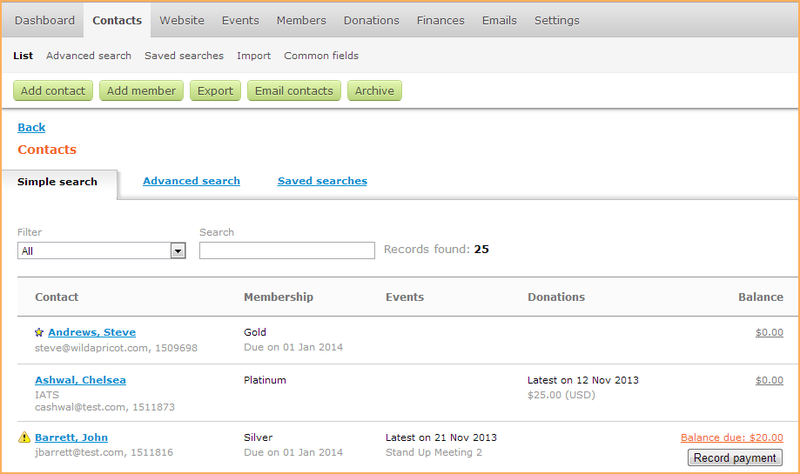 Using the toolbar buttons at the top, you can add a new contact or a member, export the current list of contacts, send a mass email to the current list, or archive the current list. Before emailing, exporting, or archiving, you can filter the list using a simple search, an advanced search, or a saved search. From the Simple search page, you can perform a keyword search or/or use predefined filters to filter the list of contacts. To filter your contact list using one of the predefined filters, click the Filters drop-down and choose a predefined filter. Contacts that require some action from you. For example, contacts that have applied for membership but their payment. Contacts like these are indicated by a yellow warning icon next to their name. Contacts that have current membership. Contacts with current or past event registrations (including waitlist registrations). Contacts that have made donations. Contacts who are not members. Contacts to whom an email has recently failed to be sent. Contacts that have been archived. In the search results these contacts will be grayed out to indicate they are not active. 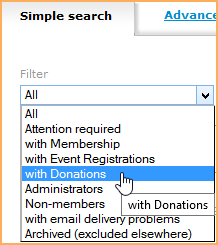 To view a list of contacts with suspended membership, select All from the Filter drop-down, and then do a keyword search on the word Suspended. You can further filter the contact list by entering a keyword or phrase. From the Simple search screen, just start typing the word or phrase you want to find in the Search field. Those records that display the word or phrase you enter will automatically appear in the list. Archived records are only included in the list if the Filter is set to Archived. The records are automatically sorted by last name. If the last name is missing, then records will be sorted by first name, then organization, and finally by member ID (aka user ID). Your entire member list will be searched, but only 100 records are displayed at a time; use the Show dropdown list to scroll through the results. From the Advanced search page, you can combine multiple search criteria, and control whether any or all of the criteria needs to be met. For more information, see Advanced contact search. When you perform an advanced search, you can save your search criteria for future use. Once you save an advanced search, it appears on the Saved searches page. From here, you can run the saved search, view the search criteria, or remove the search from the list of saved searches. For more information, see Advanced contact search. To view a contact's details, just click on the contact within the list. From the Contact details screen, you can view and edit contact information, and use the Prev and Next button to browse through other contact records in the list. 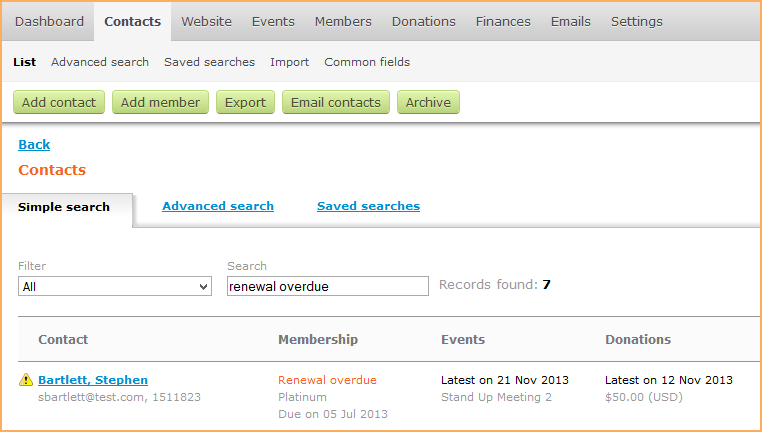 The Profile last updated field indicates the date and time that common fields, membership fields, or member group participation were last updated, either by an administrator, a Wild Apricot support representative, by import, or by the contact themselves – but not by automatic membership renewal. You can use this field in your search criteria when performing an advanced contact search. Initially, this field will be set to a value of Never.